We are proud to support the following charitable organizations. 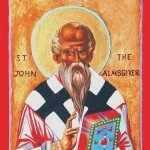 We encourage you to follow in our example; to do that which is right. Please consider donating your time or money to these outstanding charities. The National Coalition Against Domestic Violence (NCADV) supports women and children's shelters across the United States, serves to impact public policy and legislation which affect battered women and their children, and help community-based programs educate others about the impact of domestic violence. The mission of the National Autism Association is to respond to the most urgent needs of the autism community, providing real help and hope so that all affected can reach their full potential. 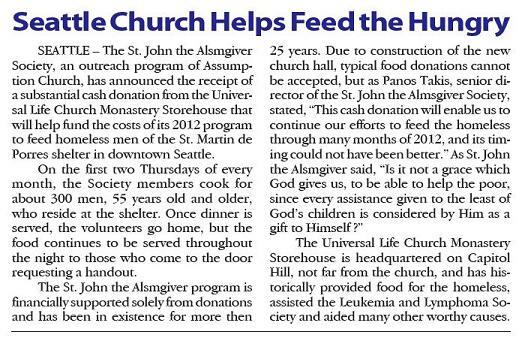 Thanks to our minister's support on Facebook, the Universal Life Church Monastery was able to make a $1,000 donation to support this mission. Our donation was generously matched by the Mayer-Johnson organization, raising a total of $2,000 for this very important cause. Real Change exists to create opportunity and a voice for low-income people while taking action to end homelessness and poverty. Since its founding in 1967, the Children's Hospital Foundation has raised millions of dollars from individual donors, charitable foundations, and corporations to enhance medical services and programs, and to help care for children who could otherwise not afford to pay. Our goal is to build a strong financial base for the hospital current and future needs through a full spectrum of development activities. The Leukemia & Lymphoma Society (LLS) is the world's largest voluntary health organization dedicated to funding blood cancer research, education and patient services. The mission of LLS is to cure leukemia, lymphoma, Hodgkin's disease and myeloma, and improve the quality of life of patients and their families. Since its founding in 1949, LLS has invested more than $600 million for research specifically targeting blood cancers. Lifelong AIDS Alliance is committed to preventing the spread of HIV, and to providing practical support services and advocating for those whose lives are affected by HIV and AIDS. New Beginnings is a Seattle-based organization that provides support, resources, and services to victims of domestic violence. In addition to helping victims directly, New Beginnings spreads awareness about domestic violence through education initiatives, outreach events, and community training programs. Seattle Education Access provides higher education advocacy and opportunity to people struggling to overcome poverty and adversity. At a time when a college degree is what a high school diploma was to previous generations, the minimum entry-level requirement for almost every well-paying career, UNCF plays a critical role in enabling more than 65,000 students each year to attend college and get the education they want and deserve. Lambert House is a center for Gay, Lesbian, Bisexual, Transgender and Questioning youth that encourages empowerment through the development of leadership, social and life skills. For more than 40 years, YouthCare has been a leader in providing effective services to Seattle’s homeless youth. In 1974, a group of concerned citizens started a three-bed shelter for homeless and runaway youth, the first in the Western United States. Since then, they have grown to become a community-based agency with six sites serving the greater Seattle area. Chad's Legacy Project is an organization working to spread awareness about mental illness and reduce the stigma surrounding it. In particular, they stress the importance of proactive care coordination and creating effective treatment options that are readily available for those in need of help. Rainier Scholars is a multi-faceted education program which creates pathways to college graduation for low-income students of color. They provide hands-on academic support, personalized assistance, and leadership development for hundreds of Seattle youth. The Fortune Society helps individuals who have been incarcerated reenter society and rebuild their lives. The organization also advocates for limitations on harsh sentencing and promotes alternatives to incarceration. To date, the Fortune Society has provided over 7,000 individuals with life-changing assistance. 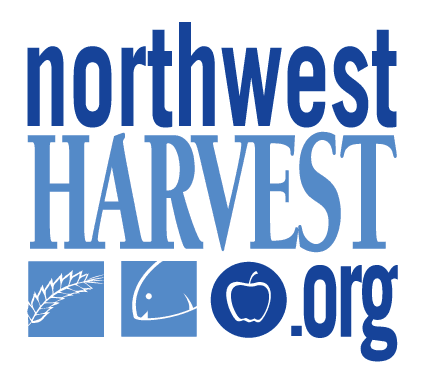 Northwest Harvest is the leading independent hunger relief organization in Washington state. With a focus on nutritious food, Northwest Harvest oversees a network of 375 food banks and meal programs, providing over 2 million meals every month to those in need.